WASHINGTON — A federal appeals court hears courtroom arguments Tuesday on a challenge to President Donald Trump's ownership of a luxury hotel five blocks from the White House. The attorneys general of Maryland and Washington, D.C., accuse Trump of violating the Constitution's emoluments clauses, which bar the president from receiving "any present, emolument, office or title of any kind whatever from any king, prince or foreign state" or any state in the U.S. Their lawsuit, filed in 2017, says the president improperly benefits financially whenever foreign or state governments patronize the Trump International Hotel on Pennsylvania Avenue. Justice Department lawyers counter that the term "emolument" has a very specific and much narrower meaning — a payment made to a public official in addition to his or her official salary. Under that reading, financial benefits from an office holder's private business dealings would be exempt. Federal District Court Judge Peter Messitte of Maryland, where the challenge was filed, ruled last year that the suit could go forward, marking the first time a federal judge had ever interpreted the emoluments clause. Administration lawyers are asking the U.S. Court of Appeals for the 4th Circuit, based in Richmond, Virginia, to throw the lawsuit out. A central question is what the term "emoluments" means. Because there's no history of past court rulings about it, legal scholars have offered conflicting views. John Mikhail, a law professor at Georgetown, says every dictionary that would have been consulted by the nation's founders defined the word broadly as a gain, benefit, advantage or profit. But Andy Grewal, a law professor at the University of Iowa, says the term refers to "office-related compensation," a view endorsed by the lawyers for the Trump administration. They argue that the constitutional provision bars only payments "conferred and accepted as compensation for the official's services in an official capacity or employment relationship." The Justice Department says the founders did not assume that the term encompassed income from a president's private business dealings. George Washington and Thomas Jefferson exported some of their crops to foreign countries while in office, the Trump administration's court papers say, and no one objected to it. The administration also says Maryland and D.C. have no legal standing to sue, because there's nothing in the Constitution or federal law allowing lawsuits that allege violations of the emoluments clause and because the local governments can't prove any direct injury. 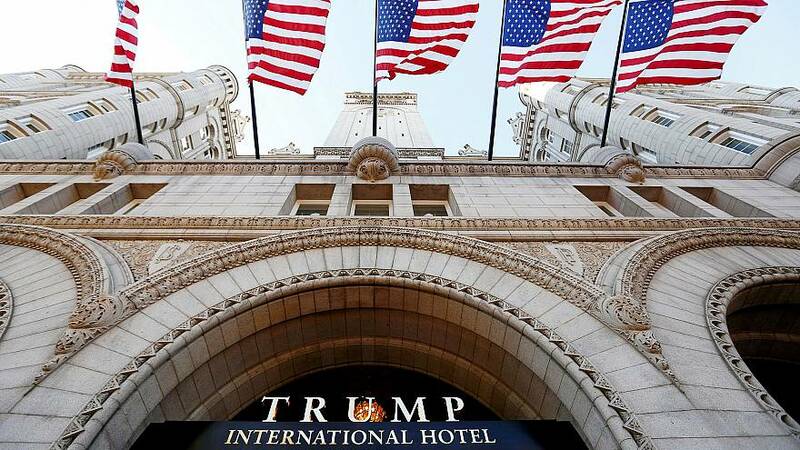 But the plaintiffs say high-end businesses in their communities have been hurt by competition from the Trump hotel which offers a perk they cannot — the chance to patronize the president's business. Maryland and D.C. say they also operate event spaces themselves that compete in the same marketplace. The appeal stopped progress on the lawsuit, just as the plaintiffs began issuing subpoenas in an effort to learn more about operation of Trump's Washington hotel. So far 38 subpoenas have been sent, including five to federal agencies. Karl Racine, the D.C. attorney general, says if the litigation goes forward, it may be necessary to obtain Trump's tax records. "No other president has ever run a business and actually sought business from foreign sovereigns while being president," he said.